A new group has been formed along the Fylde Coast, called the ‘Fylde Peninsula Water Management Group’ which is looking at surface water, flooding and bathing waters. They will be examining how the different factors interplay and affect each other and what steps have to be taken to make sure that our bathing waters on the Fylde Coast pass the ever tightening levels set by the European Bathing Water Directive. On a practical level the Fylde BeachCare project will be working with community groups, the general public and businesses across the Fylde to show them how by changing their behaviour everyone can contribute to improving the quality of our bathing water. Basically, there isn’t enough capacity in the system for the amount of water that goes through it. As with the majority of the UK, the drainage and sewage systems were built in times long ago when water usage and populations were lower, and changing habits in modern times from lots of different factors affect the water quality. There has been talk recently about bathing water failing testing, particularly here in Blackpool. In the 1980’s a list of bathing beaches was drawn up, and this is still in use today. So for example, over at Fleetwood, the beach at the back of the Marine Hall area is classed as a bathing beach, but the beach at the side of the RNLI station isn’t and so the water won’t be tested. During the bathing window of the summer season from May and September, tests are taken once a week over 20 weeks to measure the levels of bacteria in the water. Keep Britain Tidy are the people who run the Blue Flag Award for clean bathing beaches throughout the UK. Bacteria levels aren’t just a consequence of the big polluters, but the actions of each and every person on the coast can contribute to overflow of sewage into rivers, which means that ultimately bacteria and sanitary waste ends up on our beaches. The overcapacity of water in the system means that if a blockage is caused in the pipes at a time which coincides with heavy water flow, the system simply cannot cope so the excess is spewed out into the environment – this is what the project aims to reduce, or in an ideal world, eliminate. Anyone who is already running a group with an environmental interest who would like to start doing some work on the beaches or rivers is urged to get in touch. There is a small pot of money available to help groups to buy equipment such as litter pickers and sack hoops, plus a whole host of information that you can use to kick-start your own beach/river care project. If you have longed to get involved, or know of a beach grot spot that you would love to sort out, they can help you to set a group up. Public liability insurance and risk assessments – the red tape which blocks many a community group, is provided through the project, along with a handbook for getting started and practical help from the Project officer – along with some equipment of course! A few groups run a regular beach care programme throughout the year on the Fylde Coast, including Rossall Beach Residents & Community Group at Cleveleys, and the Friends of Lytham Estuary. The Rossall Beach Group have already Adopted the Beach through the Marine Conservation Society (MCS) – the MCS encourages beach cleaners to measure and weigh the amount of litter which they collect so that data can be used to campaign against reduction of sewage at source. 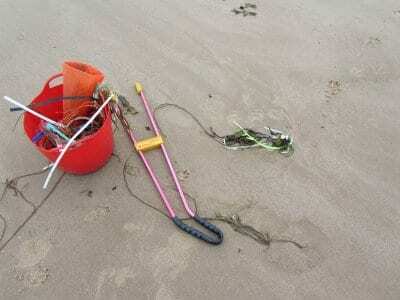 The MCS encourage good practice and the monitoring of beach litter by collecting data that can properly be compared month on month, by picking in a defined area each time. If you want to get involved with the Fylde Beach Care Project you can find all their contact details on their own page at this link.